A child learning to ride a bike loses their balance and falls, or perhaps even an adult on a “misadventure” gets in an accident and knocks out a tooth. What do you do? Do Something and Do It Now! The success of this replantation procedure is directly related to how soon the tooth is replaced in its socket. If possible, just rinse the tooth with tap water and gently replace the tooth in its socket and come to the office. Otherwise, wrap the tooth in a clean, moistened cloth (or put it in a cup of water or milk) and get to the office, now. Never scrape the tooth or allow it to dry out. For children, we consider replantation successful if we can keep the tooth in position at least during the growth period. 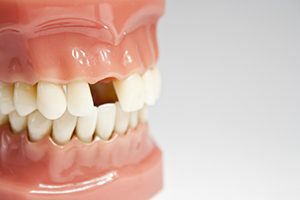 By maintaining the space, the replanted tooth prevents movement of adjacent teeth. If it’s necessary to replace the injured tooth, it’s much easier to do it when the child is older—when all the permanent teeth are in. The good news is that we have bonding and implant techniques today for tooth replacement and new materials to fill in for a lost tooth. If a dental emergency should happen, please remember to act quickly, stay calm, and come visit us with the tooth replanted or kept moist in transit. We’ll take care of you immediately. Have You Knocked Out a Tooth? In Case Of A Dental Emergency!